Do you have ancestry in the Otago region? 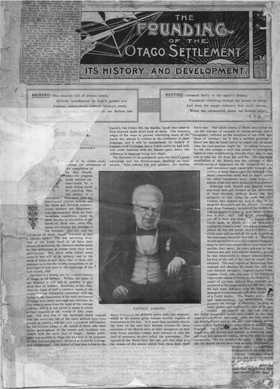 The Founding of the Otago Settlement; History and Development [Otago Daily Times and Witness] is typical of a provincial commemorative publication with numerous references to local identities and in this case sprinkled with many old and interesting photographs. Such publications when utilised thoroughly by historians can give an excellent idea of the community and its people in past times. Family names including Cargill, Burns, Jones, Richardson, Kettle, Reynolds, McGlashan, Cutten, Anderson, Adam, Harris, Rennie, Gillies, McAndrew and many others have the advantage of also being featured in photographs! Material also includes biographic data on some of the prominent settler families including those named above and many more. The passengers on the John Wickliffe, the first vessel to arrive with settlers, are named. While not every resident of the community is named, some significant developments and incidents are depicted, and events such as this would have been experienced by all in the community. This is an invaluable resource for all with a past associated in this area of New Zealand. Old historical records like these are a valuable genealogy resource for social historians, and a must for anyone searching their family history or building a family tree. They provide information on the environment experienced by the residents of the time and how they lived, as well as their occupations.